My reading habits have steered into the business-ish aisle lately. In January, I subjected my Book Club to this business gem: Sway: The Irresistible Pull of Irrational Behavior. I found it fascinating and many of them were actually interested enough to read it. Which is an accomplishment! In February, a friend and I were chattering over lunch one day and she shared Gretchen Rubin’s year-long study of happiness, The Happiness Project. Dug it, too. I’d recommend this one to any woman out there who finds herself juggling wifedom, motherhood and a career. With all that going on, it’s easy to lose perspective. 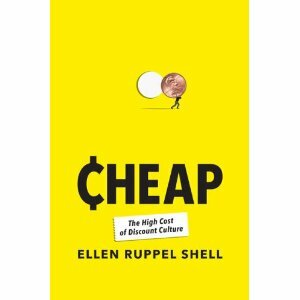 Now I’m on Cheap: The High Cost of Discount Culture. I stumbled across this one at the library last week. Just a few chapters in but liking it a lot. It’s converging a bunch of topics that I never really thought were linked: rented building, once-robust parts of town and people’s need to amass large amounts of stuff. I am interested to see where all this goes. If you have a book or two you’ve enjoyed lately, please share them in the comments. Always on the lookout for good reads!